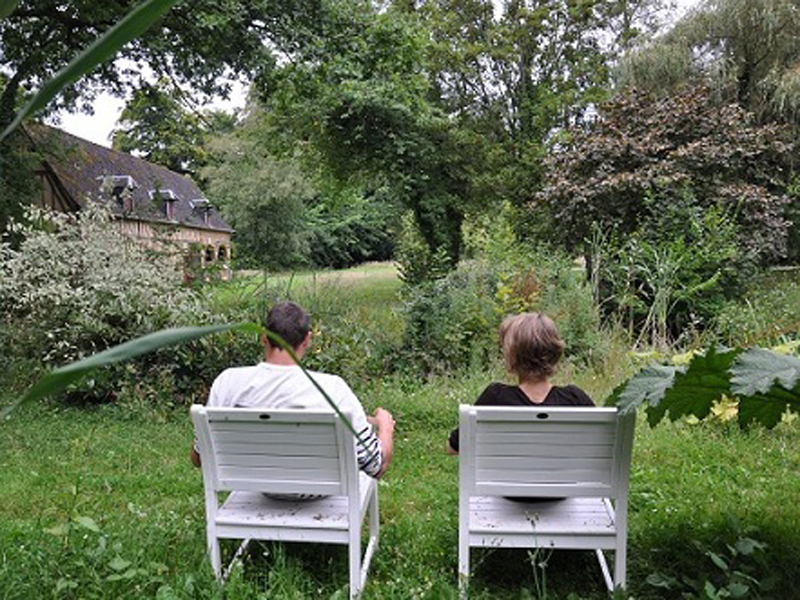 Forget about everything and drop your suitcases at Dominique and Sylvie's Domaine de Bretteville: an unspoilt place where plants and animals are free to grow and interact. This 16th century thatched cottage, a former noble residence, was bought by Dominique's grandfather, who restored the decaying building to start his farm. Today, Dominique still grows wheat but there are no animals left. The current residents are now squirrels, fawns, doe and deer as well as owls and all kinds of birds. It's not unusual to see them along the paths that the owners have created to provide unobtrusive openings into this rich and profuse nature, which is ideal for those who enjoy nature and wildlife photography. Dominique had the idea of running holiday cottages when he was 17 years old. So it is a real life project he decided to carry out with Sylvie. He was in charge of the work, especially the woodwork, one of his hobbies, and Sylvie decorated the holiday cottages with a traditional Norman style. Here you will enjoy the simple things in life: watching animals, listening to birds singing, eating in the tree, warming up by the fireplace after a night walk, etc. Sylvie loves to see the enchantment in the eyes of her guests when they discover the property. Most of them describe the place as 'haven', and the owners are pleased to welcome people to this timeless place in total harmony with nature. A stay as extraordinary and invigorating as a breath of fresh air: this is what is waiting for you at Stéphanie and Sébastien's. It took four years of work to convert this farmhouse, part of their family heritage, into a special and safe place for families. The owners have insisted on renovating the buildings in an environmentally-friendly way. They have created comfortable B&B bedrooms, with original beams and punchy colours, as well as an eco-friendly holiday cottage for their guests to try living close to nature. The owners are always working on new projects and really like to show their region. And they have an unusual way of doing it: Walks with pack donkeys. Go on an adventure with those kind and obedient animals along the trails and paths of the region. Sébastien enjoys calling them 'walking backpacks' as they will carry the delicious picnic made by Stéphanie with organic, home-grown vegetables from the 4,000 m² vegetable garden that Sébastien will be happy to show you. He will tell you all about work with donkeys and you will be able to taste fruits, grains, flowers and vegetables fresh from the branch: what a treat! The 'Coq à l'Ane' is thus the ideal place to gather with your family, recharge your batteries, enjoy new experiences and rediscover true flavours. The Clos du Quesnay embodies the essence of Normandy: Jean-François wanted to represent the Norman bocage, the hedgerows typical of the Pays de Bray: he rose to the challenge by planting 9,000 trees and putting wooden caravans near a former road that used to take carts to Rouen. Jean-François also produces traditional homemade cider, Pommeau and Calvados in the old vaulted cellar, where the first owners of the farm, in the 18th century, used to make Neufchâtel cheese. If Sabine lets her husband take care of the garden, she, on the other hand, got on with the interior decor of the four wooden caravans and of the five B&B bedrooms: warm and muted colours, carefully chosen fabrics, warm atmosphere and high standard of comfort. Those staying in the wooden caravans will be surprised by the functional and ingenious layout of these out-of-the-ordinary holiday cottages. The “Assiette Gourmande” (generous single plate with various ingredients) and the cider served on the terrace will definitely convince you of the tranquillity of the place located in a green setting. Sabine cooks good local produce and offers table d'hôte meals: she prepares apples in all the possible ways and&nbsp; cooks her poultry with Norman alcohol. The B&B includes a hearty and delicious breakfast: homemade bread, brioche, jam and cake. A walk in the 4-hectare park planted with trees, a picnic by the playground, or a drink on the indoor terrace surrounded by roses are all precious and pleasant moments you will enjoy at the Clos du Quesnay. 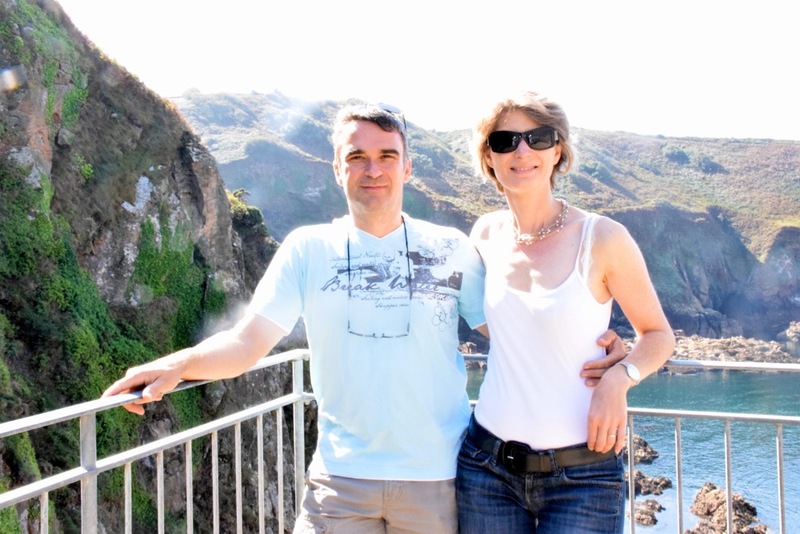 During your stay, Jean-François and Sabine, a former choirmaster and a former music teacher, will be both available to help and careful to let you make the most of what the property has to offer. Always up for new projects, they definitely have a passion for genuine hospitality. Welcome to 'Le Moulin de l'Epinay'. Lynn and Duncan welcome you in French or in English to share with you their love for the Pays de Bray. A French professor at the University of Kent, Lynn discovered Normandy when she came to give lectures in the region. She and her husband fell under its spell and decided to settle in Normandy: this is when the B&B project began. 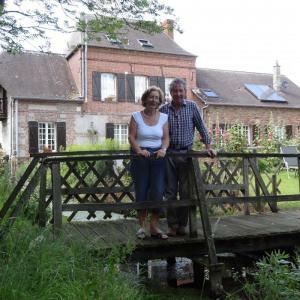 They bought this watermill dating back to the French Revolution, and brought back its original charm. Life is tranquil, you'll enjoy being by the river, looking at the golden trout, or visiting the hens and chickens and observing the animals in the neighbouring fields. 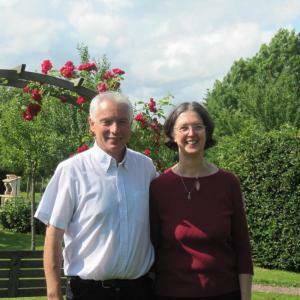 Lynn and Duncan offer pleasant B&B bedrooms (including one with a small kitchen area) and are full of little attentions to make their guests feel comfortable. They love to receive guests and chat with them. Duncan is fond of classic cars, and Lynn will be happy to invite you to try her cooking, which she defines humorously as 'international '. At the table d'hôte, you will enjoy meals made with local produce: herrings from the area, vegetable and Neufchâtel cheese gratin, pork tenderloin with a cream and cider sauce, etc. And for dessert, Lynn prepares her famous crumble, a secret family recipe! You will enjoy a pleasant and tranquil stay at the Moulin de l'Epinay, with its British touch! It is funny to know that Nathalie grew up next to this big farmhouse without knowing what adventure lay ahead of her. Built by her great-grandfather in 1892, this farm building used to be a cowshed and a granary, but in 2004, as she saw the building fall into disrepair, Nathalie decided to move its residents back in, some hens and sheep in the outbuildings. Then, with her husband and family's help, she renovated the farmhouse to create the Maison de Campagne. It took nearly two years to convert the cowshed, the stable, the chicken coop and the pigsty into a special place for families and an area dedicated to children. The wooden play equipment in the orchard and the classroom (in the holiday cottage 4045) will delight children whatever the weather. Her husband, a keen woodworker, did it all by himself. Inside, Nathalie insisted on keeping original features. Thus, the hayracks, the troughs and the old louvered shutters now have a new purpose: give the Maison de Campagne a true bucolic country style look. Nathalie also enjoys hunting for old furniture, which she tastefully and cleverly transforms into unique pieces. But more recently she preferred working with wood, beads, fabric and pastel: you will be able to discover her latest creations <br> in the holiday cottages. Nathalie took care of the finishing touches to create a unique and warm atmosphere in each house. She wants you to feel at home, and to get to know the region of her childhood. She is proud of what she has done thanks to the help of her family: they have put their heart and soul into it.